So let’s talk foundations. Without a good base what chance does our make-up have. I mean would you go out with a dramatic smokey eye minus foundation? Your foundation is the perfect start to a flawless finish. Finding the ‘perfect’ shade is almost impossible! Congratulations if you have found yours, I am incredibly jealous and my search for the perfect foundation continues. I feel confident with my choices of night time foundations as I like a medium to heavy coverage with matte finish and long lasting effect. Estee Lauders ‘Double Wear’ in ‘Tawny’ is brilliant. I never have to top up my makeup on a night out and it matches my Cocoa Brown Tan perfectly. This is also a dance proof foundation from my experience so 5 out of 5 stars from me! I also use MAC Studio Fix in shade NC30. Both of these are lovely foundations but they are not what I look for in a day time foundation so my hunt is still on. I am so fussy with my foundation as I want the complete opposite amount of coverage that I would want for a night out. In an ideal world Armani Silk 4.5 is my perfect foundation however I am on the search for a cheaper comparison as I just seem to go through my bottle too quickly. So lets take a look at today’s comparisons from Catrice, GOSH, MAC and Benefit Cosmetics. At this price you really cannot go wrong! I had never tried any of Catrice’s products before and then decided sure why not and bought it. One pet hate of mine is not being able to try the foundation on first to get the perfect shade. This is one thing that I don’t like about pharmacies as I often don’t know what shade to go for and panic but I took my chances and it worked out for the better. If you can, try put a small amount of the tester on the side of your cheek to match up your shade. This shade was perfect on my skin. At the time I had only a small amount of tan on and that is the when I run into trouble with my foundation shade. Perfect for really tanned or super pale but not for in-between. The Verdict: The coverage is light-medium which is perfect for during the day. I found it a little bit on the shiny side but then again I have an oily t-zone, nothing a bit of powder can’t fix. Only fault is that there is no SPF in this foundation. 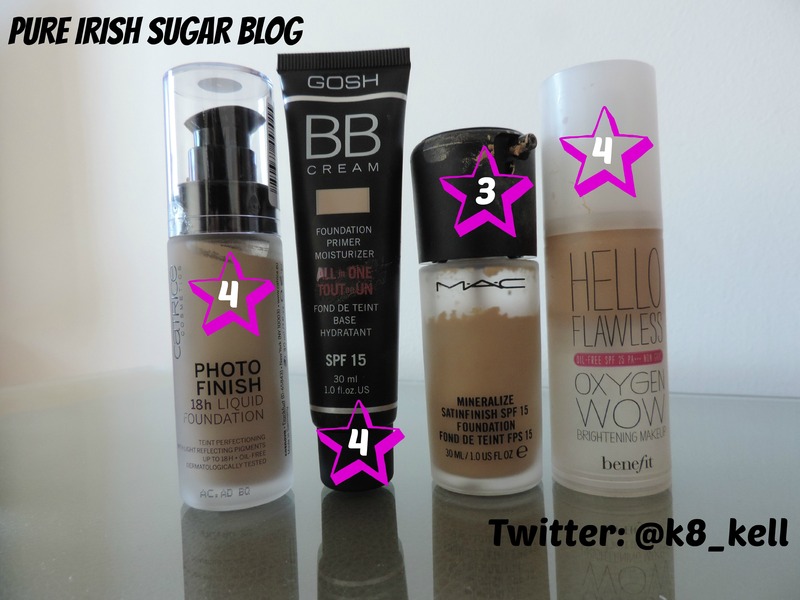 I loved this foundation, well it is a BB cream but I am putting it in the ‘foundation’ category. I wore ’01 Sand’ when I had no tan on and loved it so much I went straight out and got the next shade up ’02 Beige’. You can also buy GOSH online and they have FREE delivery to Ireland so when you are running low you can quickly order it straight away! Click here for their website. The Verdict: Light coverage but lasted until I got home from work which is usually impossible so I was extremely impressed with. When you are out and about you don’t want to be checking your foundation every few minutes. This BB cream has SPF 15, my skin looked radiant and it didn’t absorb into my pores. If you want a heavier coverage then I would suggest layer using a powder too. Only downside is that I went through my first bottle too quickly! HA! This foundation has since changed name since I bought it and is now called ‘Mineralize Moisture Foundation’. This was a foundation I picked up in the airport once because I realised going on holiday that I had forgotten all my foundations and was in such a panic that I just grabbed it before my flight. Personally I find MAC foundations hit and miss for during the day. I cannot be without it on a night out but I find during the day that the coverage is too much for me. I like to look like I am wearing no foundation. A difficult look to pull off I must say but MAC unfortunately just doesn’t suit me during the day. The Verdict: Medium coverage with good texture and a variety of shades to find your perfect match. It has SPF 15 which is really good but the foundation doesn’t fade well on your skin throughout the day. Often when I wear this during the day I will have to keep an eye out that I have not gone patchy. Please let me know if you have tried this foundation and had a different experience as I would really like to know! I have this foundation in 3 different shades I like it so much! Why do I like it so much? Well first of all it has the highest SPF in a foundation that I have tried which I am very conscious of. Benefit’s packaging is so cute and I first tried this foundation when I got a sample of it when Hello Flawless first came out. The coverage of Hello Flawless is light-medium and wears really well. I would still have to often top up my makeup while wearing this foundation. The Verdict: Having SPF 25 is only amazing! The product will last you ages. Last year my friend Aimee and I spent 4 months travelling and went through two of these bottles which is surprisingly good seeing as we wore makeup everyday. The pump on the bottle is really good to get the foundation out as sometimes with other foundations you are left scraping the end of the bottle. So there you have four different foundations that I use from day to day. I will be comparing others soon as I like to change my makeup especially with the weather changing. I hope you found my guidelines helpful but remember everyone’s skin is different and what suits one person may not suit another. Finding the right balance of coverage can be difficult but I would love to hear what your thoughts are on my selection. What is your favourite foundation and have you tried any of the ones that I have used? Let me know! Posted in BeautyTagged Beauty Must Have, Benefit Cosmetics, Benefit Foundation, Catrice Cosmetics, Estee Lauder, Foundation, GOSH, GOSH Ireland, Hello Flawless, Light coverage, Mac cosmetics, Medium coverage, Which foundation should I useBookmark the permalink. Agree with you on the GOSH BB Cream. I have it in Porcelain and it gives a really nice finish and doesn’t dry out my skin. Do you dare to go Red?